The National Italian American Foundation recreated its 40th Anniversary Awards Gala Weekend into an extravaganza of song, homage to heritage, family ties, and passion for food. The Foundation’s celebration of its 40-year milestone united Italian American and Italian cultures of the past with an eye to the future. The NIAF gala was presented by Alitalia in an unpresented partnership between the Italian airline carrier and NIAF. NIAF Board member and Emmy Award-winning Fox News Anchor and Global Markets Editor Maria Bartiromo, and NIAF President John M. Viola, co-hosted one of the most popular black-tie galas in our nation’s capital at the Washington Marriott Wardman Park Hotel on October 17, 2015. Global music sensation Il Volo – Piero Barone, Ignazio Boschetto, and Gianluca Ginoble – captured the guests’ attention on stage singing the popular Italian song “Volare.” They closed the evening with “Grande Amore,” their orginal song that won the Sanremo Music Festival in 2015, to a standing-only audience. “The only reason I am here tonight is because of my father, he taught me the importance of heritage,” said 12-time MLB All-Star Mike Piazza. He encouraged the guests to pass our rich heritage and culture to the next generation. Piazza was joined by actor Chazz Palminteri, who shared a similar message: “I beg you to give to NIAF; this Foundation represents leadership in the Italian American community,” said Palminteri, urging guests to not forget NIAF’s mission and help students through scholarships. This year’s 40th Gala Dinner Chair and a NIAF Board Member J.J. Cafaro, welcomed a sold out ballroom of more than 1,700 guests from across the United States and Italy. Patricia de Stacy Harrison, 40th anniversary celebration chair, NIAF vice chair, and president and CEO of the Corporation of Public Broadcasting, introduced a video highlighting what it means to be an Italian American from its leadership, past and present. NIAF Gala honorees included Italian American musical singing legend Connie Francis, who was inducted into the Italian American Hall of Fame. Accepting the award on her behalf, Viola urged guests to nominate Ms. Francis to be inducted into the Rock and Roll Hall of Fame. NIAF awarded the Foundation’s Special Achievement Award in Business and Health to Richard E. Caruso, Ph.D., founder and director of Integra LifeSciences, a world leader in medical technology. “It has been my lifelong goal to make a difference in people’s lives, and I’m grateful that I’ve had an opportunity to do so.” Caruso said. He was introduced by Peter J. Arduini, president and CEO of Integra LifeSciences Holdings Corporation, and a member of the NIAF Board of Directors. Steve Perillo, president and owner of Perillo Tours, America’s largest travel company, received the NIAF Achievement Award in Business. Perillo was the longtime apprentice to his father, the legendary Mario Perillo, “Mr. Italy.” He spoke about the family-owned company that is now celebrating 71 years in the travel industry. Between award presentations, Italian classical guitarist Tom Sinatra passionately serenaded guests to popular Italian songs. The Foundation’s former executive director and senior fellow at the Center for American Progress, Alfred M. Rotondaro, Ph.D., received the Italian American Community Leadership Award. Rotondaro remembered the early founders of NIAF: “NIAF is a place that nurtures Italian Americans. The Sicilian Tenors, including Aaron Caruso, Elio Scaccio and Sam Vitale, stepped on to the stage to serenade the guests to “O Sole Mio” before NIAF Executive Vice President and chair of the Italian American Leadership Council (IALC) John F. Calvelli introduced the IALC’s work in finding the next group of leaders. NIAF’s Co-Chair of the Education and Grants Committee and a member of the Foundation’s Board of Directors Anita Bevacqua McBride welcomed the 40 under 40 list of Italian Americans, and introduced NIAF’s new Italian American leadership fellows from universities across the country. Three prominent Italian and Italian Americans, who have distinguished themselves in the fields of government, finance and business received NIAF 40th Anniversary Awards for Leadership and Service. They were Amato L. Berardi, founder of Berardi & Associates Inc., and former member of the Italian Parliament; Mario J. Gabelli, founder, chairman of GAMCO Investors Inc., a New York Stock Exchange listed company; and Franco Nuschese, president of Georgetown Entertainment Group LLC and owner of Cafe Milano in Washington, D.C. Upon receiving his award, Berardi spoke about the importance of the support and love he received from his family as the best medicine after a recent accident. Gabelli dedicated his honor to his father. He explained the importance of the scholarships NIAF awards to young people and giving back that opportunity for others to achieve. When Sergio Marchionne, CEO of Fiat Chrysler Automobiles, N.V., came to the stage, he explained, “I am merely here to plead my case, my outfit tonight is an international dress code.” Since he spends most of his time on an airplane, he wears the classic white shirt and a black pull over sweater. “Our sense of place stays with you where you go. My father taught me integrity, civil engagement and sense of duty. My mother taught me strong will and sensitivity,” said Marchionne, who received the NIAF Special Achievement Award in International Business. “I am a legal immigrant, blessed to be born in Italy and adopted by the United States,” was the message from Josephine J. (Gargiulo) Templeton, M.D., trustee of the John Templeton Foundation. NIAF awarded Templeton with the Foundation’s Special Achievement Award in Philanthropy. She thanked Justice Samuel A. Alito Jr. for recreating and writing the speech he gave at the 150th Anniversary of the Gettysburg Address. Alito welcomed the men and woman who bravely served in the military. He recognized them as the “voice for Italian Americans.” Alito also introduced a video chronicling the activities of the NIAF’s Public Policy program. 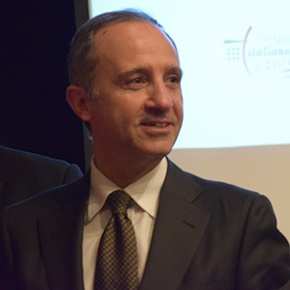 Dignitaries from Italy at the Gala included Italy’s Ambassador to the United States Claudio Bisogniero, who led an Italian delegation of business executives. From the United States, special guests included: U.S. Representatives Tom Marino, Joe Heck and Mike Pompeo; Anthony Fauci M.D., director of the National Institutes of Allergy and Infectious Diseases; Lawrence Romo, director of the Selective Service System; and actors Vinny Pastore and Tony Lo Bianco. Guests rose to their feet when Carlo Rotunno sang “Inno di Mameli,” Italy’s national anthem and singer and songwriter Giada Valenti sang the U.S. national anthem. During the Gala dinner, a selection of red and white fine Italian wines were served from Italy’s Northern regions that complimented Barolo braised short ribs with polenta and chicken Scarpariello with Italian sausage. To kick off NIAF’s Gala Weekend, the Foundation partnered with the Italian American Studies Association (IASA) to host a series of conferences on Thursday, October 15, through Saturday, October 17. Beginning on Friday, NIAF and the Italian American Leadership Council (IALC) hosted a NIAF on Campus Conference with industry experts and 30 Italian American college students and professors selected as Italian American Fellows. They were joined by NIAF’s leadership, including Ken J. Aspromonte; Gabriel A. Battista; Robert E. Carlucci, Arthur J. Furia; Marie L. Garibaldi; Gerard S. LaRocca; Patricia de Stacy Harrison; Anita Bevacqua McBride; George Simeone; Salvatore Salibello; and John P. Rosa, who gave their perspectives on successful career practices. Friday evening, SNL legend, NIAF Celebrity Ambassador, actor, entertainer and radio host Joe Piscopo launched the weekend’s evening celebrations with “Joe Piscopo and Friends Celebrate Sinatra’s 100th Birthday.” Piscopo was joined by Valenti and Deena Martin, daughter of the late Dean Martin, as the Radio King Orchestra stepped up the beat throughout the evening. NIAF auction chairman, Rosa was on hand to encourage guests to bid on one-of-a-kind items during the live and silent auctions and to purchase a chance to win a Fiat 500 L Lounge. 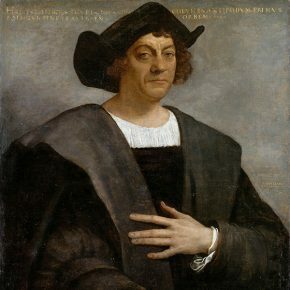 Beginning Saturday, NIAF and the IALC hosted a leadership forum to discuss potential strategies to address the contentious issues surrounding Columbus Day. Noted journalists, representatives from the National Christopher Columbus Association and the Italian Sons and Daughters of America, as well as leaders of the Italian American community joined the panel. Popular weekend events included a documentary screening of “The Tale of the Other Italy,” produced by Rai Italia and directed by a Luigi Maria Perotti. The film tells the Italian emigration story through the various entry ports. It shows how Italian Emigration Museums around the world with their projects, pictures and documents plays a key role in preserving and understanding the past as well as understaning the new Italian emigration in the world. NIAF also hosted its signature wine tasting featuring 11 Amarone wines from Italy’s Northern regions with a sommelier on hand to lead guests through a spectrum of Italian wines. Wines were assembled by Patrizia Marin, president of Marco Polo Experience; representing the 11 vineyards were Marie Sabrina Tedeschi of Tedeschi Wines and Antonio Cesari of Brigaldara Wines. The weekend also featured a medical conference, “Health and Research: Beyond The Eyes” with a panel discussion about the latest research and common eye conditions with Antonio Giordano, M.D., Ph.D., president and founder of Sbarro Health Research Organization Inc., and a NIAF board member, and other notable speakers including Michele Masucci, Ph.D.; Vito M. Campese, M.D. ; and Paul Tapino, M.D. Giacomina Massaro-Giordano M.D. and Dolores Del Raso presented the 2015 Giovan Giacomo Giordano NIAF Award for Ethnics and Creativity in Medical Research. Also during the weekend, Viola hosted “NIAF – Ieri, Oggi, Domani,” an engaging panel discussion focusing on the current state of the Italian American community and its challenges as we move forward. Viola was joined by the Foundation’s Chairman Joseph V. Del Raso, board leaders Calvelli, and Harrison; board members Nicholas R. Caiazzo and John P. Rosa: and Jeff Browning, president of the Italian American Staff Association. Expo Italiana, a showcase of the sights, sounds and products of Italy and Italian Americans, included Mike’s Deli, the original Arthur Avenue Italian Deli, with David Greco serving complimentary old-fashioned sandwiches, pasta, and Italian delicacies. Peroni Nastro Azzurro served samples of Italy’s finest beer; espresso at Lavazza Café as well as coffee to guests on Friday and Saturday evening. Guests also relaxed and enjoyed many products displayed by companies including Dolce Gelato, La Famiglia Del Grasso; Amina Rubinacci, and Petrone Antica Distilleria, to name a few. Immediately following the Gala, guests proceeded to attend the Foundation’s famed After Hours Celebration featuring live entertainment with singer and songwriter Ciro Di Lorenzo, and others in the Marriott Lobby Lounge.